I went to Georgia for a Jeep CJ parts swap meet this weekend (30 March 2019). I met some cool people, saw some (no exaggeration) awesome Jeep CJs, and even picked up a few parts I was looking for. I was sort of surprised at the number of parts I saw-- It ran the gamut of rare, NOS items to used, more commonly available stuff. I wasn't really surprised at some of the prices, but I managed to get a fair deal on the stuff I was looking for. My question is, in 30 or 40 years, will there be swap meets with people looking for original JK parts? Here is a (shortened) video of some of the Jeeps owned by Jody and Dawn Abbott who hosted the meet. Very nice couple who are as crazy about Jeeps as we are! Notice the Jeep CJ tailgates along the top of the rear wall. 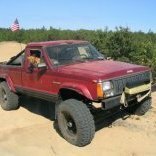 They also have Jeep Comanche and FSJ truck tailgates lining the porch railing of their house! I love that World Top and that Super Jeep! I totally forgot about that event. I should have went.